If I was in the catering business this would be my go to meal. 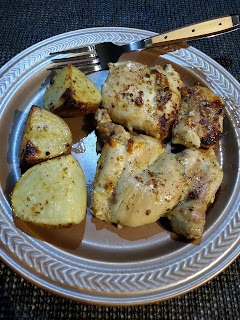 In large bowl, add chicken thighs, salt, pepper, greek seasoning, garlic powder, minced garlic, lemon juice, olive oil and potatoes, using your clean hands, mix well. Arrange chicken and potatoes onto a lightly greased roasting pan. Pour chicken broth around chicken and potatoes. Bake at 425 degrees, about 40 to 45 minutes. Half way through cooking, spoon pan juices onto chicken and potatoes, Cook until chicken is no longer pink in center. I love Greek flavors! This sounds perfect for any day of the week! It really is perfect for any day of the week. Thank you! I adore Greek lemon chicken, yours looks fab!